You are here: Home » Blogs » Get behind your team and your manager! Posted by: supreetkini on February 21, 2012 in Blogs, Guest Writers Comments Off on Get behind your team and your manager! It’s that time of the season again. Heads swooning, shoulders dipping, glum faces, the lot! Arsenal Football Club finds itself in a mire, having been knocked out of that one competition that we had real chances of winning, in a week that also saw us being almost knocked out of another competition. I have taken a lot of time to contemplate what to write. I thought I would write on Sunday, the day after the Sunderland loss, and vent my feelings. However, I was at a loss of words. Finally, after three days of thoughts pouring out of my mind, I have been finally able to type down something, about what the fans stance should be. We saw over the course of two games, our defence having its soul being ripped apart, in immediate succession. In Per Mertesacker, we lost a vastly experienced and cultured defender, who finally looked like he had adjusted to the demands of a demanding league. In Laurent Koscielny, we lost probably the best defender in the league at the moment. And, who were the ones who replaced them. A calamity and a disaster messrs Djourou and Squillaci. And in hapless fashion, just like our defence, we were ripped apart, one by an extremely talented Milan, and then by a dogged and determined Sunderland. Swords have been polished and they are all out, as an outpouring of negativity ensued. Talks of sacking Wenger, sacking the board, getting rid of deadwood, making multi-million pound signings followed over the course of 2 or 3 days. The Telegraph, Daily Mail, Independent all voiced their opinions about Wenger should do next. Writers, the likes of Piers Morgan, Mark Lawrenson, who as Wenger rightly quoted as people not having managed a club, let alone a club in European football. It has been a late realisation of sorts of a poorly managed summer transfer window and a largely quiet winter one. A team crippled with injuries, that no other club is facing at the moment. We had all our 4 availalable full backs in the medical room nursing long term injuries, and what’s more they were all doing it at the same time. Andre Santos arrived as that bustling full-back Arsenal fans so longed to see. He played a few games and bam, he is out for 3 months. Kieran Gibbs, his deputy, too suffered the same fate. Mr Consistent Bacary Sagna, suffered an unfortunate injury in the North London derby, and then his deputy Carl Jenkinson too found himself taking the aid of a physio. Players, the likes of Arshavin, once the darling of all of Europe; Chamakh, once touted as the next big thing in French soccer; Walcott, at one time, branded as England’s new hope, have all waned over the course of the season. To add to the long list of woes, we had our best player from last season, Jack Wilshere, sustaining an injury from pre-season, and will probably sustain it till the end of the season. Criticism pouring in blaming Arsene Wenger’s youth policy, of blooding in youngsters too early, and expecting them to win trophies. And mind you, these are the same people who billed Wilshere and Alex Olade-Chamberlain as too young to take the Premier League by storm. Criticism aimed at Arsenal’s lack of tactics. The same system being employed, irrespective of whether the team is winning or losing. A team that has been living on past glories for quite some time now. Wenger’s substitutions all gone wrong, for eg. Arshavin being bought on for Chamberlain in the Manchester United game. Not that I am against the criticism. There are actually hell loads of valid points in there. But, those who are actually criticising the team, it is time the team needs your support. Arsene Wenger is still Arsene Wenger. He is still the same manager who broke the monopoly of Manchester United in the league. He is still the same man who guided us through an entire season unbeaten. He is still the same man, who changed the face of English football. He is the man who gave the football world the mercurial talents of Thierry Henry, Patrick Vieira, Fredrik Ljungberg, Ashley Cole, Kolo Toure, Francesc Fabregas, Robin van Persie, Samir Nasri, Jack Wilshere etc. He is the man, who took Arsenal from mid-table mediocrity to a Champions League Final in the span of just 10 years. He has gifted us European Champions League football, season in, season out. He is the man who sustained us and kept us competitive as we oversaw a shift in stadiums. And what’s more, he has done it on a shoe-string budget. Hell, he is the reason why, in all probability, you shout for the team wearing guns on their chests. He has earned the right to get more chances to lift the team out of the slump that they find themselves under. Would you rather side a Manchester City or a Chelsea, who don’t fall in the same categories of tradition, history and class as Arsenal. Who are owned by rich oil magnets and throw cash as is their will. Or a Manchester United or a Liverpool, who without a shadow of a doubt are as great as Arsenal, or probably greater, but find themselves deeply riddled in debt. A situation, which many in European football, including the top man in UEFA, Michel Platini describes as being ‘unethical’. We face a huge game this weekend, against our local rivals, who have now created a gap of 10 points between us and them, and thus made a mockery of the North London divide, that has stood unflinching for so many years now. A team, brimming in confidence, and with the likes of real international superstars, Modric, Bale, van der Vaart and Adebayor. The importance of this game is as massive as ever. I am concerned, about the current affairs of my team, as is any Arsenal fan for that matter. There is no two ways about it. We have gone 6 seasons without a trophy, which could be seven, unless we muster 5 goals against AC Milan, which seems as unlikely as ever. Wenger is still the man for the job. Just imagine Arsenal getting a Mourinho or a Guardiola. It would be akin to Graeme Souness at Liverpool all those years back. They haven’t won a league title since. It would damage the entire structure of the club that Wenger has built with his devotion for so many years now. And, would you want that to happen for a trophy? Success is dependant on a thin line. It will come eventually. Even I am a bit worried, that the likes of van Persie, Vermaelen, Koscielny, Sagna may never have anything to show for all their talent at Arsenal. But, it will come eventually. It has to. 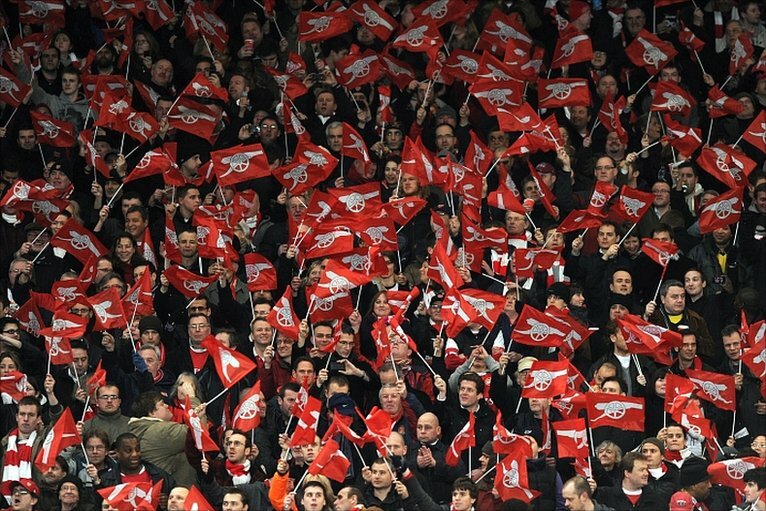 For now, all I ask all Arsenal fans, is, the season is not over yet. There’s still 13 league games to play and a Champions League game as well. Who knows, what may happen in Europe, if we can replicate what Deportivo did to Milan, all those years back. But, nonetheless, we should get behind our team, pump up the volume, and support them vociferously, as they look to seal 4th spot. It may not be ideal, but it’s the best we can get this season. Let’s not let down our club, which we claim to be die-hard supporters of and promised to stick by them though thick and thin. See out this season, and hope for the changes to ring in during the summer. That’s all I request from my fellow Gooners. Previous: Pep Guardiola to replace Wenger?